Hero - Holding Out for a Hero (ヒーローHOLDING OUT FOR A HERO) is a song set to be used in the Japanese version of the 2019 Hollywood film Detective Pikachu. The cover being used in the film is the one performed by Miki Asakura (麻倉未稀) that was originally released back in 1984. It is a cover of the Bonnie Tyler song Holding Out for a Hero. 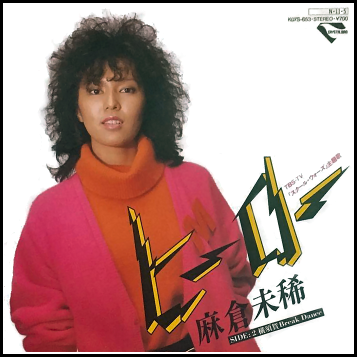 Miki Asakura's cover is one of two covers of Bonnie Tyler's Holding Out for a Hero released in 1984. Yuki Katsuragi (葛城 ユキ)'s was released on July 5th, 1984 while Miki Asakura's was released on November 5th, 1984. There are slight differences in the lyrics between the two versions despite both being written by Masao Urino. Detective Pikachu uses Miki Asakura's version. The song was used as the opening theme to the 1984 TBS drama School Wars ~The Crybaby Teacher's Seven Year War~ (スクール☆ウォーズ 〜泣き虫先生の7年戦争〜). It would later go on to be used as background music for various sports events in Japan. Dogasu's Backpack is a fan-created website. Pocket Monsters (Pokémon) is © 1995-2019 Nintendo / Creatures Inc. / GAME FREAK, Inc. / TV-Tokyo / The Pokémon Company International / 4Kids Entertainment Inc. etc. No infringement of copyrights is meant by the creation of the web site.